$39.99 & FREE Shipping on orders over $59 $35. Are you looking for a nice, crisp, and cool beer for the summer heat? 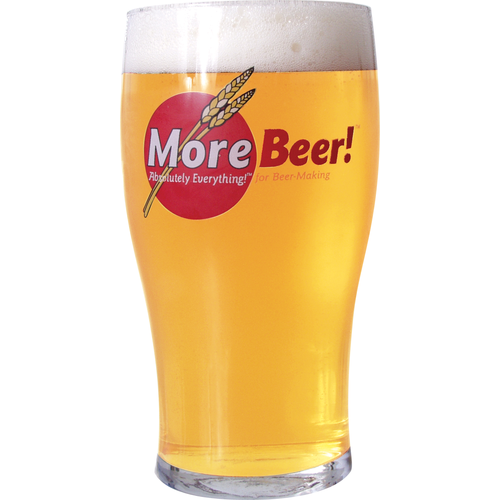 Morebeer! has got you covered. This Belgian starts with a crisp pilsner base to build from and then it adds the floral, spiciness of Helga hops during the boil. To top it all off the beer has an interesting citrus back ground flavor from the blood oranges to make it the perfect thirst quencher for a hot summer day. You can either choose a neutral yeast like Giga Nor Cal or you can choose from various Belgian Strains that will add various degrees of clove/banana flavor to the beer. If you know you like interesting Belgian beers opt for a Belgian strain. If you are thinking general crowd pleaser then go with Giga Nor Cal or White Labs California. Recipe includes 1lb of Belgian Style Blood Orange Candi Syrup that is made in the USA from 100% cane sugar. As the reviews note the Blood Orange flavor is not overwhelming but does add a background flavor. We suggest you aso read the five star reviews for the Blood Orange Candi Sugar itself. It is always a fine line between having your beer have an artificial fruit flavor that jumps out of the glass versus a natural flavor that is blended into the beeer itself. We think the latter is the case. If you think you want a more pronounced orange flavor purchase an additional 1lb of Blood Orange Candi Sugar - of course you are also adding residual alcohol as well. Beware this is an easy drinking beer that can sneek up on you! For the greatest flavor impact add the Blood Orange Candi Sugar directly to the fermenter after high krausen has passed, or roughly 3 days into active fermentation. Get your kit today and make a nice light beer that is easy to drink by the pool. Blood Orange Candi Syrup - 1 lb. its summer time and that means light beer, but it also means that I don't settle for Beast Ice. 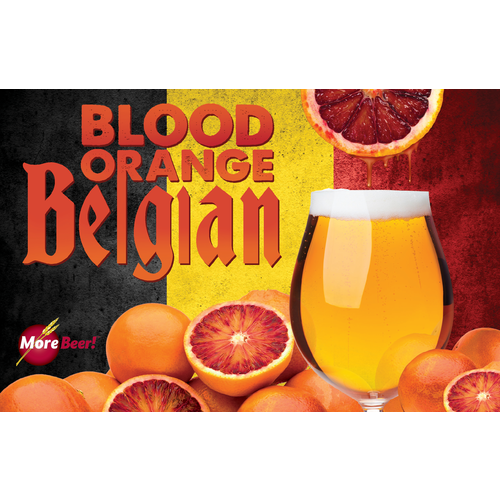 Want to do a fruity peach beer what better than belgian and oranges to balance it all out. 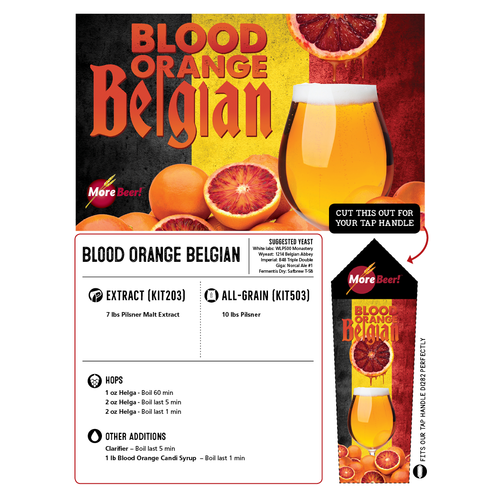 I've always wanted to brew my own Blood Orange beer, and now you have a kit! What yeast is recommended for this kit? BEST ANSWER: Near the bottom of the page you can usually find all the recommended yeasts for the kits. This list is the suggested ones we list for this kit. I like a good strong Belgian but this one just missed the mark with the blood orange flavoring. Added several of the jars in the secondary and was not pleased with the results. Love the orange flavor though - will add it to a blonde or wheat beer to really get the authentic flavor. Great intro to all grain. First all grain recipe ever. Do not typically like Belgians so this was an oddball for me. Mashed at 148, fermented with wlp560 at 68ish for 3 weeks. Kegged and force carbonated to 15PSI. Fermentation smelled like blood orange at first but quickly changed to banana bread. The first days in the keg the beer had a strong clove/bubblegum presence, but it has mellowed tremendously. I can't say I get any blood orange from the recipe but being my first all grain it could be operator error. I don't know if it is because this is my first all grain or not, but this may be my favorite beer I've made (from an IPA fan). Do not get me wrong, this is not my preferred style of beer, but it is so much cleaner and has so much more depth of flavor than any extract kit I've brewed. My best description for what my brew day results taste like is a lager with some Belgian-y funk. Super light and refreshing, feels like fancy college beer.